Schuylkill River boaters paddle the waters just below Flat Rock Dam. Issues with water quality in Rio de Janeiro, home of the 2016 Summer Olympics, have local water sport enthusiasts thinking about the value of clean water. With all eyes on Brazil for the 2016 Summer Olympics, one big health concern right up there with the Zika virus is the water quality in rivers, bays and surf around Rio de Janeiro. While athletes no doubt would prefer to focus their attention on winning, the risk of getting violently ill from the very water they’ll compete in and on is a serious hurdle aquatic athletes will have to contend with this year. Recent tests by government and independent scientists revealed a veritable petri dish of pathogens in many of the city’s waters, from rotaviruses that can cause diarrhea and vomiting to drug-resistant “superbacteria” that can be fatal to people with weakened immune systems. 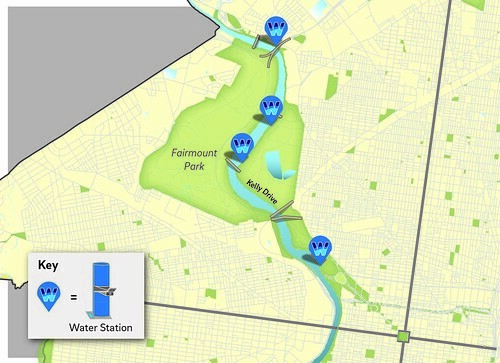 There were lots of big names and important figures on the banks of the Schuylkill on Oct. 23 to announce a new network of water bottle filling stations along the Schuylkill River Trail, "America's Best Urban Trail" and Philadelphia's most popular recreational path.